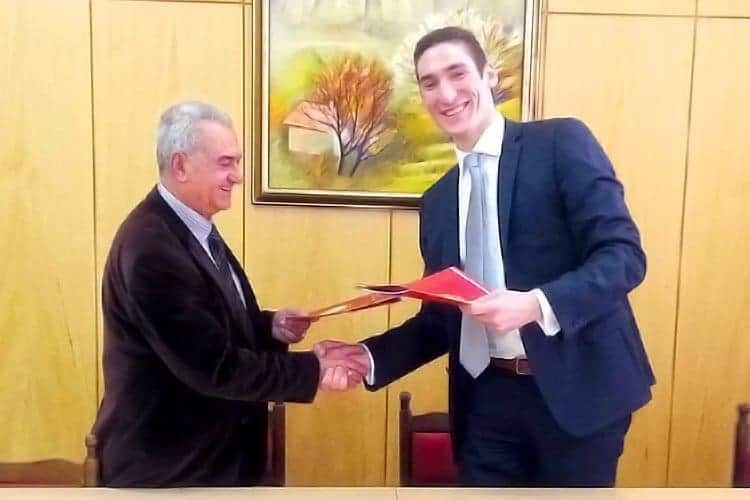 In the photograph (from left to right): Prof. Ivan Vashin, Rector of the University; Mr Aris Grigoriou, Student Recruitment Manager of Study Medicine Europe Ltd.
Why Study Medicine or Veterinary in English at Trakia University – Stara Zagora? Do you meet the requirements? Click to Ask! +Why Choose Trakia University – Stara Zagora? Trakia University – Stara Zagora was re-established in 1995 following the merging of the highly regarded Veterinary College of Agriculture & Zoology and the Technical College. It is recognised as an internationally accredited Eastern European University, consistently rated “very good” by the international accreditation system. The university has a wonderful campus boasting a vast library as well as a university hospital in Stara Zagora. The university is home to over 6,500 students who are taught by more than 600 highly qualified lecturers and tutors every day. Students learn in state-of-the-art medical departments with 20 research labs and 16 diagnostic clinics. +What do the Medicine & Veterinary Courses involve? Medicine is an entirely English-taught programme which lasts for 6 years. During the first 2 years students focus on pre-clinical study and theory, before moving on to clinical study between years 3-5. Students undertake mandatory practical summer from 2nd to 4th year. In final year, they complete an internship year of medical rotations. Upon successful completion of all requirements, students receive the professional qualification of physician or Doctor of Medicine (MD) and are awarded a master’s degree. The qualifications are recognised worldwide and graduates can choose to continue their specialisation in Bulgaria or continue their practice in countries all over the world. Taught entirely in English, this 5 and half year programme culminates with an internship in affiliated hospitals and clinics. The first 3 years focus on fundamental pre-clinical and para-clinical skills with an obligatory summer course in the 3rd year. The course focus then shifts to clinical practice with a clinical training internship in the 4th year. In the 5th year, students undergo species-orientated training and work in mobile clinics and help with practical training. Students are also required to complete state exams in their final year. Upon graduation, students are awarded a master’s degree and the qualification of veterinarian. You can also choose to continue your specialisation in Bulgaria as there is a high demand for veterinary specialists and a very low cost of living. +How much do the Medicine & Veterinary programmes cost? +Admission to Trakia University – Stara Zagora? An application form including your biographical data, educational history and the course for which you are applying. Diploma (a copy) of completed secondary education with an academic transcript of the disciplines studied. Document issued by relevant authorities in the country secondary education was completed, confirming that the candidate has the right to continue education in higher schools and universities. Health certificate issued less than one month prior to application and verified in the country the candidate is applying. All documents must be translated into Bulgarian and authorised in accordance with official state directives. Stara Zagora is a major Bulgarian city with a total population of around 220,000. For a small city, it has a particularly strong economy due to the many industries in the local suburbs. The city enjoys a mild climate as the surrounding mountains and hills help to protect the city from strong northern winds. Its proximity to the sea allows for much warmer winters than in other parts of Bulgaria. Stara Zagora is home to many churches, an opera house as well as several museums and art galleries. The Black Sea is only a one-hour drive away and it is a two-and-a-half-hour drive to the capital Sofia. Bulgaria, located in the Southeast of Europe, has a total population of around 7.5 million. The country has a particularly strong industrial and agricultural market economy, with its capital Sofia enjoying a thriving economy of 1,500,000 people. Bulgarians have a great standard of living and it is very cheap compared to other EU countries. Modern Bulgaria is at its core a multicultural nation and welcomes students from every part of the world with open arms.